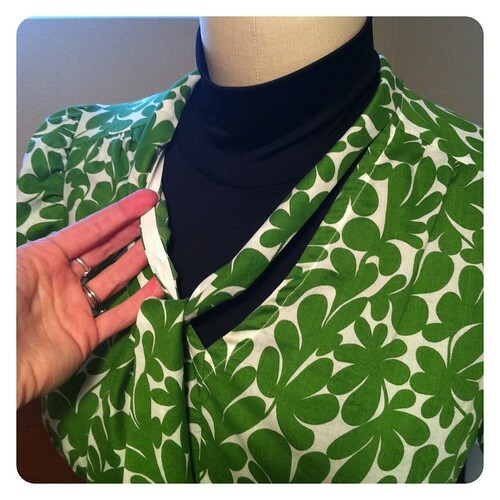 I was stitching away on my fun springtime dress, when I decided that I needed some trim for the neckline and front band. I didn't have anything in stash that spoke to me, and I didn't have time to run to the fabric store, so rather than waste good sewing time, I grabbed one of my SISC projects to do up. I had white thread on the machines, so that determined my choice. 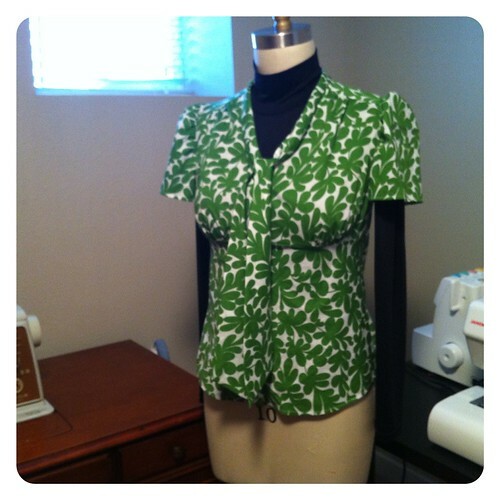 The winner was Simplicity 2614, and y'all, I'm just not thrilled with it. I really like the IDEA of this top. It's woven, but bias cut, so that it can fit nicely without needing closures. It has 45 reviews on PR as of this posting, and they are generally positive, and I like all the blouses that I see there, but I don't think this one is for me. When I put it on, I feel like I'm wearing a scrub top, which is something I spent far too many years avoiding to enjoy now. It's too bad, as the pattern is really well designed and nicely drafted. The back is cut on the bias, which is shapely, even without darts, as is the lower front panel. One note about fit (and several reviewers on PR noted this as well) the underbust seam is a bit high in the larger cup sizes. In the top picture, you can see that it doesn't even come below Sandra Dee's (perky and youthful) bustline, and I sewed the seam with a 3/8 allowance to get some extra room. 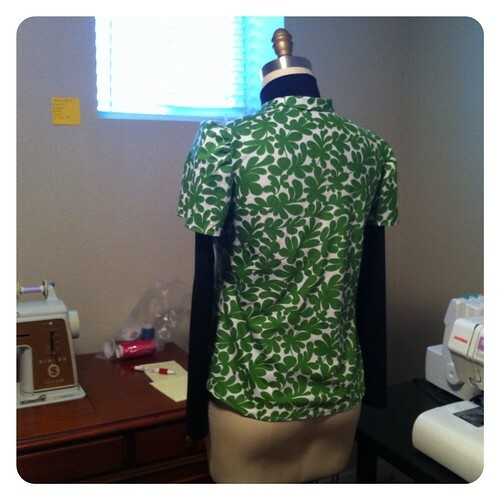 The major change I made from the pattern was to omit the facings and use bias tape to finish the neckline. The tie conceals the topstitching, so it looks pretty nice, although if I were not making a view with a tie, I would probably line the front bodice instead. I also skipped the cuffs, as by the time I got to that step, I had tried it on a few times, and was sure it wouldn't be in my closet long. I just made a plain hem on the sleeves. I think this is a good pattern, even thought it is not for me. It is now OOP, but if you would like this (uncut) copy, it is yours for the asking. It is a size 6-14, and I will happily ship anywhere on the planet. If you'd like to enter the giveaway, just leave a comment saying so (and be sure to include contact info, so I can find you if you are selected!). I will draw a name from those who are interested on Wednesday, April 11th. Do you see the sneak peek of my seersucker dress in the background? I think it's gonna be awesome, y'all. You're in! This would actually be a really easy one to alter for a maternity top, and the easy fit would be great for that fun, after the baby and before you get your body back period. I like that top... I'm not sure I see a scrub but hey I didn't wear them! I don't need another pattern but I do like this one a lot but I don't want to go into the draw as I wouldn't have time to sew it for eons. Thanks anyway - i just wanted to say I liked the top you made. Hello and thank you for the giveavay,I am interested by this little top .I am from France and it is kind if you ship it everywhere.I admire you for the beautiful items you made. thanks for the generosity. i would like to enter. I love a challenge to make a pattern look more exciting. Im in ! Hi! Thanks for the opportunity! I think the blouse is pretty as it is. I always struggle because I want to wear more blouses but am always worried they are frumpy (probably because blouses were big when I was growing up and all the old lady teachers wore them - (30 yrs ago!)). I love the polished look of a tie blouse. 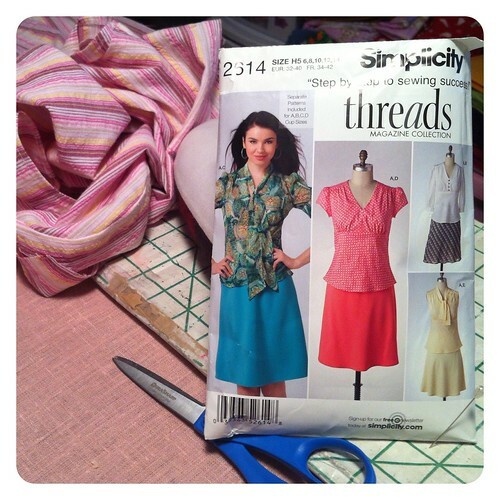 Maybe sewing my own with a new fabric will put my mind at ease! I'd like to join in please! I really like the look of this and I think it might be good without the tie too! It does look a little scrub-like, not really what I'm used to seeing you wear. That pink is your seersucker dress? I can't wait to see it. That color should be perfect on you! Hi! I would like to give this top a try, particularly with the hints you gave about omitting the facings. The bias style of the top interests me.....always up for a challenge!!! That is really too bad that the top didn't work out for you, because it's really quite cute! Please include me in the giveaway. Hi there. I'd love this pattern! Thank you for the generous give-away. That's too bad you didn't like it, sometimes we know right away when things aren't us. I'd take it off your hands, I have the perfect fabric for it! It may feel like a scrub but it sure doesn't look like one. I think it's terrific. Love the print. No, don't put me in the drawing, please. I have this pattern and have been thinking about it for quite some time. I feared the lack of shaping, though. Hmmm. I'm not going to move the project up on the list, though I will say yours looks cute. I'd like to give it a go - thanks for the giveaway. I was just looking at buying this pattern, so I'd love to be included in the giveaway. Thanks! I'd love to be included in the giveaway; this pattern went OOP before I had a chance to grab it at Joann's. Thanks!